What’s May without a Pole Dance? 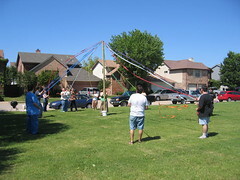 What started out as a joke between Neighbor Dan and I about how we should freak out the other neighbors turned into a beatiful Beltane mini-festival. Kudo’s to G who drove up from Austin to help out and Neighbor Dan who bought the ribbons and showed us how to play one of my new favorite games.